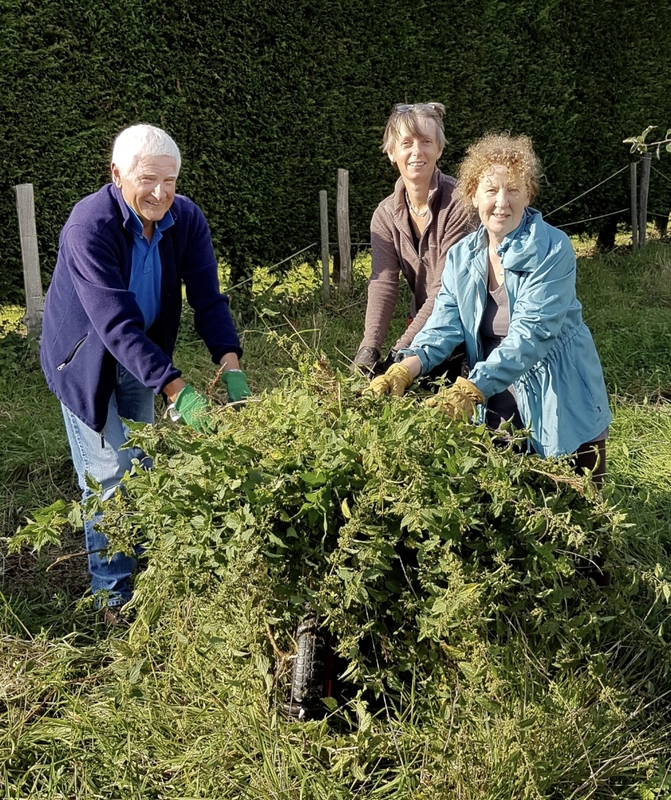 To make it easier to harvest and to cut the grass, we pulled out huge quantities of nettles that were growing around the plum trees. It seems that you just have to look away for a few weeks and there are more coming up. They were very high and and we had to be careful to stop them falling in our faces as we pulled them out. I managed to get a large nettle in my face the previous week which stung my nose and I was keen to avoid that again. We also carefully went through the grass growing around the plum trees and cut down the plum tree suckers that had come up. These are mini plum trees that pop up around the established trees and the stems are too tough for the streamer or mower. Its a slow but useful job. This is one of the piles of nettles we removed but I think we must have cleared about 5 more barrow loads over the course of a couple of hours. Today we harvested many of the apples before the wind and rain due tomorrow and I took them over the Ringden Farm in Flimwelll. With a car loaded and the weight hopefully fairly well balanced, I set off for the long drive through Horam, Burwash and Etchingham. The picture is of the bin where the apples go waiting to be pressed at Ringden. This batch is a mix of Lord Derby, Lord Lambourne, Adam's Permain, a few Crawly Beauty and Red Falstaff apples. These will be pressed, bottled and pasteurised and then be ready for sale. The Orchard looking absolutely fantastic this Spring with so many trees in blossom at the same time. In early March before the trees came into blossom we clipped little cement weights on the thin new growth branches. It looks a strange sight with the trees covered in little weights, a little like a group of alternative Christmas trees, but the weights serve an important purpose. The branches naturally grow very upright, especially on the Ashmead Kernel variety. By weighting the branches down a little the tree will grow so its easier to pick the fruit and more air and sunlight get through the middle of the branches. This helps the fruit to ripen and for the trees to be healthier. Also when a branch is more horizontal, there is a change in the hormone produced and the new growth buds are more likely to be fruit buds instead of leaf buds. So, by using these weights we are helping to make sure we get good harvest later in the year. Linda has taken a great close up photo showing how the weights are made up of a peg, a small loop of wire and the cement block. We met up at the Orchard last Sunday and took down the weights so so carefully so as not to damage the blossom.